It's the first footy game on the new oval and Nick and his team, the Cobar Creek Crocs, are desperate to win the golden cup. But when the cup is removed from its cabinet it turns into a terrifying metal monster, hungry to destroy everything in its path. And only Nick can stop it. A brilliant new junior fiction series for sport-loving kids, with sensational characters and loads of action. Ideal for younger kids who struggle to read. Shane Crawford played his first game for Hawthorn Football Club in 1993 and had an amazing AFL career over 17 seasons. He won the 1999 Brownlow Medal, was club captain for six years between 1999 and 2004 and won Hawthorn's Best and Fairest four times. Shane played 304 games before winning his first premiership in his 305th and final match. He is a regular panellist on Channel Nine's The Footy Show and the AFL's national Auskick ambassador. He has four sons with his partner, Olivia Anderson. Adrian Beck is a TV producer and has worked on shows such as The Footy Show, Logies, Carols by Candlelight, Prank Patrol and Kids WB. 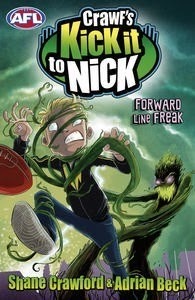 Kick it to Nick is Adrian's first foray into writing books for children and is a collaboration with AFL Hall of Famer Shane Crawford. 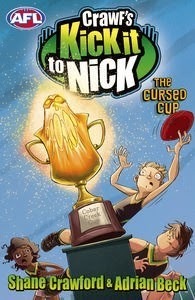 You can learn more about the series at www.kickittonick.com.